NEWBURY PARK, Calif., Dec. 12, 2018 - Platinum Tools® (www.platinumtools.com), the leader in solutions for the preparation, installation, hand termination and testing of wire and cable, is proud to announce the launch of the new EXO Termination Kits (p/ns 90185 & 90186). The kits are now shipping with MSRPs of $289.00 (p/n 90185) and $239.00 (p/n 90186). "Featuring the EXO Crimp Frame® with the EXO-EX and the EZ-RJ45® interchangeable dies, the EXO Termination Kits supply everything you need to terminate Cat5e, Cat6, and Cat6A cables," explained John Phillips, Platinum Tools, Inc. product manager. "Using the original EZ-RJ45 Cat5e and ezEX-RJ45®, ezEX™44, and ezEX™48 connectors give installers the fastest solution for terminating Ethernet cabling." The EXO Cut/Strip/Terminate Kit (P/N 90185) gives users that need all the tools to prep and terminate a cable. The EXO Termination Kit (P/N 90186) comes prepared to accept additional tools with a foam insert that has tear way foam to put strippers and cutters. "These are the ideal, complete kits," said Phillips. "Every installer should have these on hand during every call." For additional pricing and more information on Platinum Tools and its complete product line, please visit www.platinumtools.com, call (800) 749-5783, or email info@platinumtools.com. Platinum Tools, founded in 1997, was created based upon two very simple objectives. First, develop the absolute best possible solutions for the preparation, installation, and hand termination of wire and cable. Second, implement an operational infrastructure that can deliver these products in an efficient, timely, and high quality manner. All of our products must absolutely satisfy three critical benchmark criteria…utility of function; quality of function; and economic value. Our people are our company. They, too, must be focused on and work to satisfy three critical benchmark criteria…customer satisfaction; product knowledge and expertise; and willingness to learn and adapt. The ST Robotics Workspace Sentry robot and area safety system are based on a small module that sends an infrared beam across the workspace. 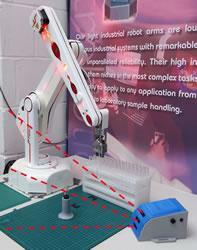 If the user puts his hand (or any other object) in the workspace, the robot stops using programmable emergency deceleration. Each module has three beams at different angles and the distance a beam reaches is adjustable. Two or more modules can be daisy chained to watch a wider area. "A robot that is tuned to stop on impact may not be safe. Robots where the trip torque can be set at low thresholds are too slow for any practical industrial application. The best system is where the work area has proximity detectors so the robot stops before impact and that is the approach ST Robotics has taken," states President and CEO of ST Robotics David Sands.